In the olden days, umbrellas were a cherished possession and were even passed on from generations to generations. However, vintage umbrellas are a rarity these days because of their delicate nature and inadequate support for care and repair. Moreover, there are only a handful of individuals who are into making modern reproductions of those umbrellas. The traditional vintage umbrellas are made of lace, wool, cotton or linen. On the other hand, modern reproductions are usually made of polyester fabrics and lace instead. So what is the proper way to care for those elegant items? 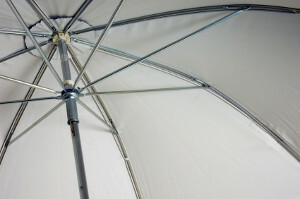 Firstly, you need to determine the material of your traditional or modern reproduction vintage umbrella. You shouldn't wash it if it's made of wool or silk. Do not attempt to dry clean as well. The fibers will weaken and eventually unravel. The best way to clean wool and silk umbrellas is to vacuum them. If your umbrella is not made of wool and silk, but has patterns or design, you can try to lather a small area with mild soap and see if the dye from the pattern or design runs. If it doesn't, then continue with the rest of it; otherwise use the vacuum. If your umbrella can withstand mild soap, you can use another method. You can lay a cloth at the bottom of the tub or inflatable pool and then fill it up with some mild soap and water. After that, proceed to soak the opened umbrella for about 20 minutes and when the water turns dark and dirty, use the sheet as a support to pull out the umbrella. Water will make the fabric heavy hence; it can easily get torn if you don't have anything to support it when getting it out of the water. Repeat the process once or twice more until the water runs clear. You can also opt to use sponge to get the soap through the fabric, but do not rub it. Then, you can pat the umbrella dry and, finally, leave it to air-dry. When it is dry, it is best to store it in a place where it can stand or lie straight to prevent the spokes from bending. An umbrella stand or bin is effective in keeping your umbrella in good condition. However, you should not leave it near your radiator, car or any hot places for long periods of time. Paper umbrellas may require some special care in certain occasions. For instance, paper oriental parasols can become quite stiff with time, especially when rarely used or after being left open for a long time. As a solution, you can try to soften the paper material with some gentle source of steam. To be on the safe side, put it to some place with high humidity, like bathroom or something similar, instead of the direct exposure to steam jet. Vintage umbrellas typically require greater care than normal umbrellas, but their rich history, together with the elegance and timeless appeal, make your effort worth it.